Ex uno plures, out of one (cell) many (neurotransmitters), seems to be a principle that applies to many, if not all, neuronal types. The co-release of signaling molecules has been long recognized and the terms “classical neurotransmitter” and “neuromodulator” have been used to label the co-released substances, often being the former of low molecular weight and the latter of high molecular weight. Indeed, the use of these terms confers a distinctive function for each substance. However, the co-release of two or more low weight, fast-acting “classical neurotransmitters” is until recently subject of intense investigation. Initially, the co-existence of classical neurotransmitters in a given cell or its terminals was a curious observation, and the possibility of they being released was not directly approached as it contradicted a dogma: “one cell, one neurotransmitter”. 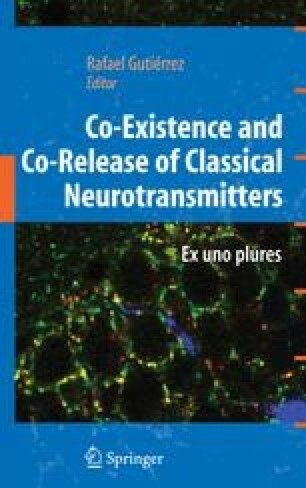 Presently, the co-existence and co-release of classical neurotransmitters is known to occur in different animal species and neuronal systems, from invertebrates to human. Moreover, the specification of the neurotransmitter phenotype of neurons has been shown to be plastic. In some cases this plasticity follows a developmental program and, in others, it depends on activity-dependent and even on pathological processes. Therefore, the listener cell should already have the receptors in the postsynaptic site or should actively put them in place to interpret a compound message, carried by two or more neurotransmitters, and integrate it to display a response. The time-locked release and thus, the action of two or more classical neurotransmitter provide the central nervous system with a powerful communication and computational tool. I thank Dr. Peter Somogyi for critical review of this chapter. Supported by the Consejo Nacional de Ciencia y Tecnología.